Hello, crafty friends, Kathi here today to host the blog. I have two Valentine cards to share with you featuring our new paper collection, "Mulberry". I love the rich colors in this collection. I started out with a 5.5 x 5.5" gold base card then I layered a 5 x 5" Mulberry paper MB105 then used the opposite side displaying the strip side up. 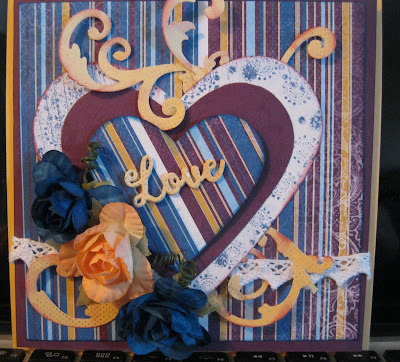 I cut three hearts from MB103 and MB105, used MB100 for the flourishes and the word "love". Blue Moon and Berry Jam PowderPuff Chalking Inks used to distress the edges of the Mulberry paper on these two cards. On the word "Love" I cut out the word out four times out of MB100, then layered them to make the word thicker and stronger. I finished the card with a small white lace trim and three roses. Card 2 is also a 5.5 x 5.5 yellow card base, layered with MB105 then MB103. The edges where distressed with a distressing tool then inked with Blue Moon PowderPuff Chalking Ink. The sentiment was stamped with Blue Moon Chalking ink on a layered label using MB100 and MB102 chalking the edges of both labels with Berry Jam and Blue Moon. The labels are layered over Venice lace. 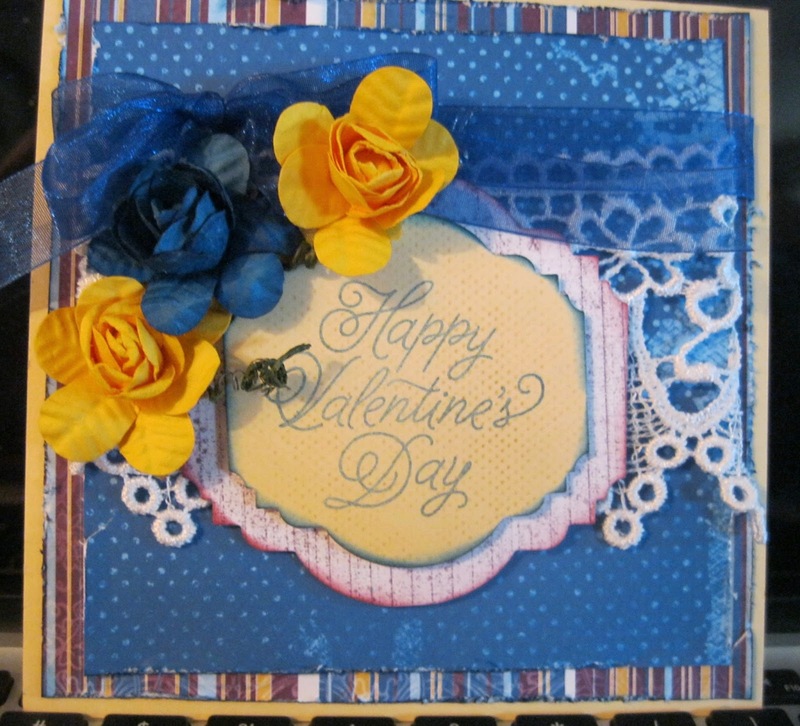 Card 2 was finished off with two yellow roses and one blue rose with a blue organza ribbon.